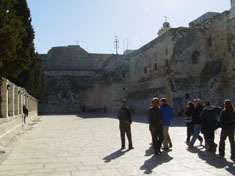 It was a beautiful sunny day when we left the Grand Court Jerusalem for Bethlehem. Our guide for the day was Tom Powers. We passed by the British Consulate, the American Consulate, the Jerusalem House, the YMCA, and St Stephens Convent/L'Ecole Biblique, where Tom has lived and volunteered since 1999, Tom took the opportunity to introduce himself and tell how he met Gordon via his Book & the Spade program when it was broadcast on HCJB short wave radio. Subsequently, Gordon published one of Tom's articles in ARTIFAX magazine. The Way of the Patriarchs from Jerusalem through the Hebron Valley along the ridge of the central watershed, connects with Bethlehem. On the way we see Ramat Rachel (the heights of Rachel, high ground near Rachel's tomb), which we will visit on another day. Entering the northern end of Bethlehem, we see a huge wall that our tax dollars have built, and we stop at a checkpoint. It was actually a shorter trip than I had anticipated, Bethlehem seeming to be almost a suburb of Jerusalem. As Salim maneuvered our bus through the narrow streets toward the bus parking ramp, Joan briefed us on certain cautions and customs regarding street vendors ("Most of the products are junk, but if you want to purchase something as a souvenir go ahead. Just know that it's junk. "), who greeted us immediately upon departing from the bus. Randy Smith took over the guiding as we joined his group of mostly students, and started with an overview of Bethlehem. As we followed him through the streets to the courtyard of the Church of the Nativity, he asked us to look around and imagine ourselves eliminating all the surrounding buildings, and go back in time about 2200 years. We would see a small village that Ezra says was founded by about 123 families. The story of Bethlehem is the story of some great kings: prophecies concern the coming of a great king, David, and the coming of the great king, Jesus. 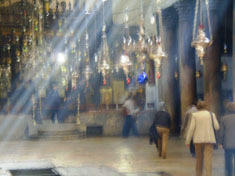 The Church of the Nativity was built in A.D. 339 by Queen Helena, Constantine's mother, over the cave home where Jesus is thought to have been born. It was destroyed during the Samaritan Revolt of 529 AD, and rebuilt by Justinian in the later 500s. 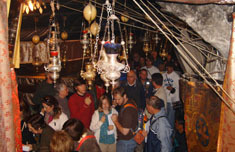 Since church art provided a market for artists, and pilgrims from all over came to pay homage to Jesus, the lamps, and artwork that each group left behind are very eclectic and mismatched inside. It is now used by Greek Orthodox on one side and Armenian Orthodox on the other side. It was very crowded inside. We were told not only to take our hats off inside, but also not to chew gum. An Orthodox vendor told two people who were sitting down, to uncross their legs, and then proceeded to leave his vendorship to go to the platform and chastise the church full of tourists for being too noisy. We inched our way to front, then to the side of the chancel from where we descended under the chancel into a cave home that was the birthplace of Jesus! From Bethlehem we drove to Herodion, the nearby fortress/palace that looks like a volcano, built by King Herod. Just a year ago it was announced that archaeologist Ehud Netzer had finally located the tomb of Herod at Herodion after a search that had gone on for more than three decades. We saw workers along the side of the mountaintop palace where the tomb had been identified but we were not able to get to that area. However, we climbed to the rim of the palace, from which we could see Jerusalem in one direction and the Judean desert on the opposite side. After lunch we returned to Jerusalem for a beautiful view of the Holy City from the Mount of Olives. From there we walked down to the Garden of Gethsemane and then we drove back to our hotel.